Name: Hero Dogs SFC Ivy Robinson - "Ivy"
Hero Dogs SFC Ivy Robinson - "Ivy"
Hero Dogs Ivy is named after SFC Ivy Robinson (Nov. 26, 1935 - Jun 25, 2007) who was a 20 year US Army Veteran. He served in several roles, most notably as a drill sergeant with the 2nd Infantry and 1st Cavalry Divisions, and as a platoon sergeant with the 11th Armored Cavalry Regiment in the Vietnam War. He served in 3 campaigns in Vietnam, and among his citations, was awarded the Bronze Star Medal and the Republic of Vietnam Cross of Gallantry. His unit was awarded the Presidential Unit Citation, which is given to a unit for extraordinary heroism in combat. I’m SFC Ivy Robinson, and I am 21 months old and ready to report to Hero Dogs for my advanced training. I have lived with my puppy raiser since I was 8 weeks old and I am now ready to move on to the next phase of my training. I have grown up to be a beautiful golden retriever and I have learned to be a loyal, smart, kind, dependable, and helpful service dog. I have learned to be attentive to my puppy raiser and to listen to commands. My vocabulary now exceeds 40 words. Training to be a service dog required me to learn specific tasks such as coming immediately when called and to ride on the floor of the car. I am not allowed on any furniture, and not allowed to beg for food nor pick any up from the ground. I have learned to assist my puppy raiser when needed... to pick up her keys, get her shoes or socks, help unload the dryer, pick up a dime, or carry a bag from the store. I have learned the proper way to go through a doorway or an elevator, how to board the Metro, how to properly walk with the shopping cart, and how to wait patiently in a line at the post office, at a meeting, or at work. Life with my puppy raiser has not just been work... I have been very lucky to have had a big backyard to run and play in. There was even a swimming pool where I learned how to swim. We had so much fun playing in the yard and going for walks in the woods. My puppy raiser tried very hard to teach me not to be afraid of flags fluttering on mailboxes, signs blowing in the wind, or people carrying big boxes. I’m still very much afraid of people dressed in funny costumes because... that’s just not right! Hero Dogs advanced training will help me to perfect my skills and make me ready for my perfect Veteran partner. My puppy raiser asked me to tell you that she is very proud of me and all that I have learned. She says that she will miss my warm brown eyes and that loving head resting on her lap. She knows I will make a terrific partner for a Veteran in need of a loving and patient companion. Summertime, summertime, fun, fun summertime! I’ve had a fun-filled and exciting summer. I’m lucky to have a swimming pool in my yard so on those really hot days I get lots of playtime in the cool pool. I love swimming after a ball or pulling the float or just relaxing on the inner tube. I’ve had the opportunity to stay with some of the Hero Dogs puppy sitters this summer. I was so happy to spend a few days with Suzanne. I know she loves me lots and we have so much fun together. I also got to spend a couple of days at the Hero Dogs kennel and that’s quite exciting since there are always lots of friends to play with. I stayed with puppy sitters Teresa and Gail and had fun with with Colin and my new friend Maverick. It was fun to go to different places, and Petra says that it’s good for me to listen to other people and know that the same rules apply no matter where I go. I am proud to report that all the puppy sitters gave me rave reviews and said that I was very well behaved. 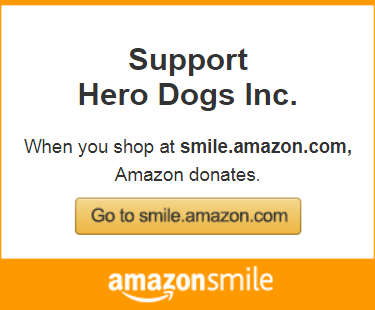 We went to a few Hero Dogs events this summer. We went to the Redskins Military Appreciation Day. We even got our pictures taken with the Redskinettes!! I am always proud to show off all that I have learned to do. My proudest accomplishment that day was that I could take the plastic water bottles and drop them into the recycle bin. I got lots of oohs and aahs for that! We were also invited to attend a fundraiser for Hero Dogs at Emergent BioSolutions. Hero Dogs Jack and I showed off some of our service dog skills… like picking up keys, coins, and credit cards and placing them on a table, and pulling the backpack and pressing the “easy" button. Thank you Emergent for allowing us to come to your picnic and for your generous donations! I have been continuing to go to class since there is always something that I need to learn. Staying close to Petra when we walk requires constant practice but I’m getting pretty good at it. I take the stairs slowly and make sure that Petra keeps up. I can “stay” for a good long time even when Petra is out of sight. Petra says that I’ll soon be going to “puppy college.” I know that I’m going to miss my home but I need to get ready for my next big adventure! Click here to read Ivy’s full blog.